If 5-2 favorite Tacitus had lost Saturday’s $750,000 Wood Memorial (G2), he could have pointed to a rough passage in the early going at Aqueduct. But the blueblood shrugged it off and won anyway, enhancing his prospects of giving international powerhouse Juddmonte Farms and Hall of Fame trainer Bill Mott a first Kentucky Derby (G1) trophy. By the time Tacitus muscled out entering the clubhouse turn, his backers might have thought that he’d already been through too much to fire his best shot. Tacitus proved the exception. Regrouping with regular rider Jose Ortiz, the gray found his rhythm in fourth as a fierce pace duel erupted up front. Not That Brady was battling the aforementioned Joevia, who caused a chain reaction of trouble early, and finally got the upper hand in their match race. But both paid the price for their exertions. Tax, third watching the duelists much of the way, was the first in position to overtake them. Yet Tacitus was also on the move on the far turn and soon ranged alongside Tax in the stretch. Although Tax tried to hang tough, Tacitus was too strong, and he edged clear by 1 1/4 lengths. Covering 1 1/8 miles in 1:51.23, Tacitus extended his winning streak to three while leapfrogging to the top of the Derby leaderboard with 150 points. He’d broken his maiden at Aqueduct in November, captured his stakes debut in the March 9 Tampa Bay Derby (G2) to earn 50 Derby points, and now added 100 to his account. Tax scored 40 points as the runner-up, increasing his tally to 52. Haikal closed for third, a 20-point result that bumps him up to 70. Fourth-placer Math Wizard, not a Triple Crown nominee, would get 10. Not That Brady tired to fifth, followed by the hampered Final Jeopardy. Joevia finished seventh but was disqualified and placed last for his role in the early interference. Next came Hoffa’s Union; Grumps Little Tots; Outshine, a close second to Tacitus at Tampa but never involved here; and the troubled Overdeliver. 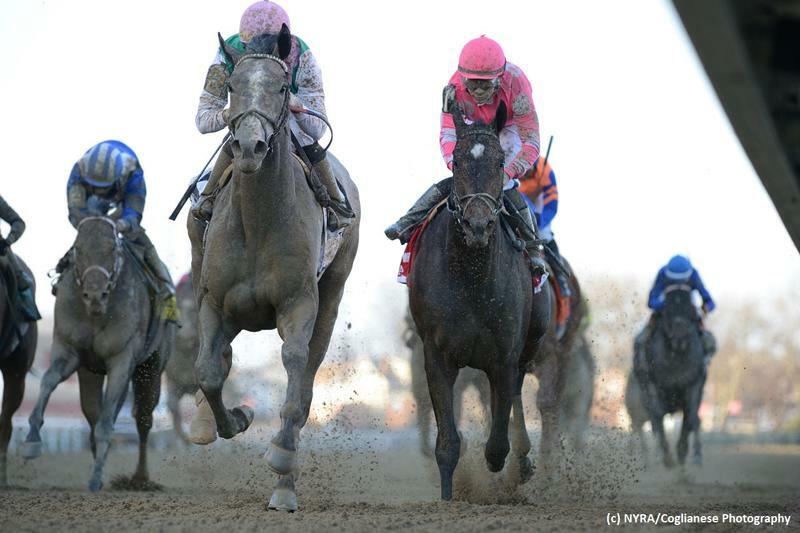 Tacitus has bankrolled $653,000 from his 4-3-0-0 record, but as a royally bred Derby threat, he’s priceless.